If you’ve been looking for info on how to build a home theater PC, you may have heard of the LibreELEC operating system for Kodi. But what exactly is LibreELEC, and why is it so popular with HTPC enthusiasts? This article will explain what LibreELEC is and what devices it can be installed on. Kodi is the software that LibreELEC was designed to run. It is an open-source media player created by the Kodi foundation. It can play many different types of media, including images, sounds, and videos. Kodi is especially useful for streaming TV shows and movies from the Internet. Because of this, it has become very popular with cord-cutters who seek to eliminate cable TV services and get all of their content online. Kodi can be installed on streaming devices like the Amazon Fire Stick, Nvidia Shield, and Apple TV, or on HTPCs like the ones discussed in this article. Streaming video always carries privacy and security risks, and using LibreELEC with Kodi doesn’t eliminate these risks. This is why Kodi users should always use a virtual private network (VPN) when watching TV or movies. ISPs often snoop on their customers’ streaming activity in order to determine which sites are using the most bandwidth. Once they get this information, they sometimes throttle the speeds of these sites, causing buffering to users. Streaming services will also often look at users’ IP addresses to determine where they are located and then block them from viewing certain content based on their location. Both of these problems can often be avoided by using a VPN. When using a VPN, your ISP doesn’t know what websites you are streaming from and streaming services don’t know where you are located. So they can’t use this information to throttle your speed or block you from viewing content. Not all VPNs are effective though. Some of them keep logs of users’ activity, creating a privacy risk of their own making. Others don’t have servers in enough countries to get around geoblocking or are too slow to stream the high-def video that Kodi users expect. We recommend IPVanish for Kodi users. It keeps no logs, has servers in over 60 countries, and is fast enough to be buffer-free when streaming 1080p video. It can also easily be installed on LibreELEC. BEST VPN FOR KODI:IPVanish is our top choice. Has a large uncongested network of servers and achieves good speeds. Strong security and privacy features make IPVanish a favorite for Kodi and Amazon Fire TV Stick users. Try it risk-free with the 7-day money back guarantee. For more information about VPNs, check out our guide to the best VPNs for Kodi. LibreELEC is a Linux distribution or “Linux distro,” an operating system based on the Linux kernel. Specifically, it’s an operating system designed to load just enough software to allow a computer to run Kodi. 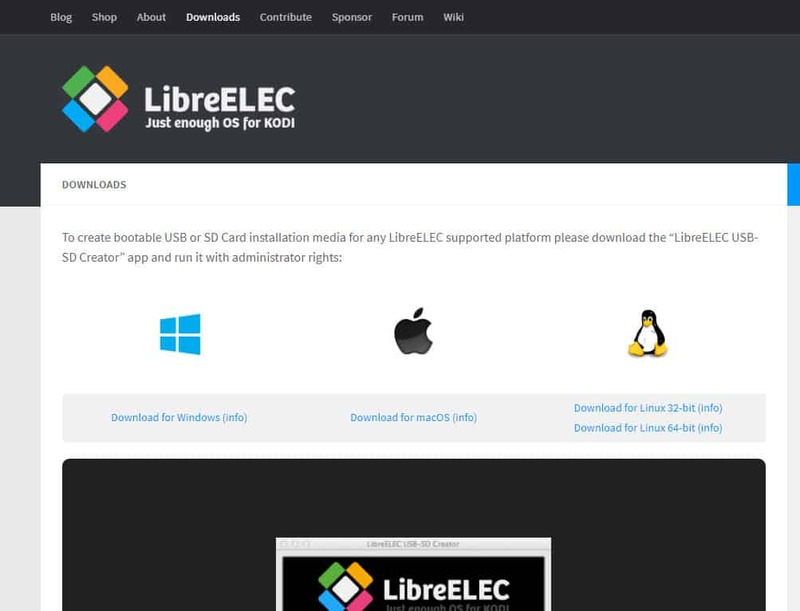 The main advantage to using LibreELEC is that it is a more efficient way to run Kodi when compared to using a more robust operating system like Windows or Mac OS. Because of this, you can generally run LibreELEC on a less powerful HTPC without sacrificing picture or sound. In essence, using LibreELEC gets you better performance from your HTPC without having to spend extra money on equipment. The main disadvantage to using LibreELEC is that it is nearly useless for running any software other than Kodi. So if you want to surf the Internet, check your email, and play World of Warcraft on your HTPC, this is probably not the right OS for you. If you only want to use your HTPC to watch movies, listen to music, and look at images, then it’s a great choice. Once you’ve got your device, you’ll need to use a Windows, Mac, or Linux PC to create the SD card that will install LibreELEC on it. 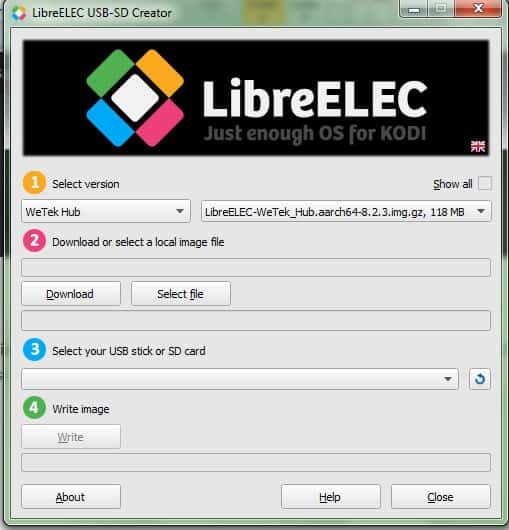 Here are the steps to install LibreELEC. 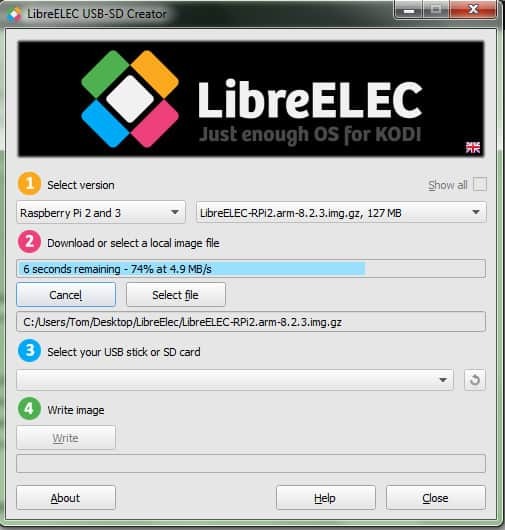 Create a LibreELEC boot SD card. Locate the file on your computer and click to run it. It’s title will be something like LibreELEC.USB-SD.Creator.Win32.exe or LibreELEC.USB-SD.Creator.MacOS.dmg. The LibreELEC USB-SD creator main window will open. When the file finishes downloading, click the dropdown menu beside the blue number 3 and select your SD flash drive. Press the write button beside the green number 4. Warning: this will erase all data on the SD card. You should only use a new SD card or one that has already been backed up. If you are using a Raspberry Pi, hit the power button. If you are using a WeTek device, press and hold “reset.” If you are using an Odroid board, plug the power cord in. Wait for LibreELEC to boot up. It may take up to five minutes. Once LibreElec boots up, Kodi will automatically load. Now you can install whatever Kodi addons you want, whether it be USTVNow, Crackle, PlayOn, Crunchyroll, or any others you may be interested in. Here is a list of the best devices to run LibreELEC on. Each of these computers consists of only a single board and costs less than $150, yet is excellent for playing movies and shows using Kodi. The Raspberry Pi is a single-board computer that was developed by the Raspberry Pi foundation in the U.K. It was originally intended to be used to teach basic computer science in developing countries, but has now gained far wider popularity than was expected. A complete “starter kit” consisting of a Raspberry Pi computer, case, SD card, and other essential accessories costs between $70-$90. The computer itself costs only about $40. Odroid computers are developed by a South Korean firm named HardKernel Co., Ltd. They were originally intended to run Android phone apps. The Odroid C2 is the latest incarnation of the device. Ordroids are slightly more expensive than Raspberry Pi computers at around $60 just for the board. Some reviewers have reported that the Odroid C2 is faster than RaspBerry Pi 3, but has less software and community support. Still, the two devices are very similar in power and cost. WeTek boxes are marketed as “set top boxes” similar to the Amazon Fire TV and Apple TV. However, they can be set up to boot into LibreELEC just like Raspberry Pi and Odroid computers do. The WeTek Hub has 1 GB of RAM and no TV tuners, while the Play 2 has 2 GB of RAM and a terrestrial digital TV tuner. The main advantage to using a WeTek box over other options is its simplicity: everything you need to use the device comes in the package with it. On the other hand, it isn’t as configurable as a RaspBerry Pi or Odroid. The Hub costs around $100, whereas the Play 2 costs around $130. LibreELEC is not the only Linux distro designed for Kodi. There are two others that are popular: OpenELEC and OSMC. Here is how LibreELEC compares to each of them. OpenELEC is the name of the software that LibreELEC was “forked” from when the original developers had a disagreement about the future of the project. OpenELEC and LibreELEC are very similar. However, because LibreELEC has a larger group of developers working on it, it tends to send out updates faster than OpenELEC. Over time, this has made LibreELEC more popular. There are still some Kodi users who started using OpenELEC before it forked though and prefer it to LibreELEC, so whether you use it or LibreELEC is largely a matter of personal taste. OSMC is another distro of Linux, but is derived from the “Debian Jessie” version. It boots straight into Kodi just like LibreELEC and OpenELEC do, but it also provides broader features found in other versions of Linux, such as the ability to run a web server or Plex media server. If you’re interested in these broader features, OSMC may be a better choice than LibreELEC. If you’re not interested in these features, then OSMC may add unnecessary complexity to the use of your OS. SEE ALSO: Plex Vs. Kodi, which is best for you? 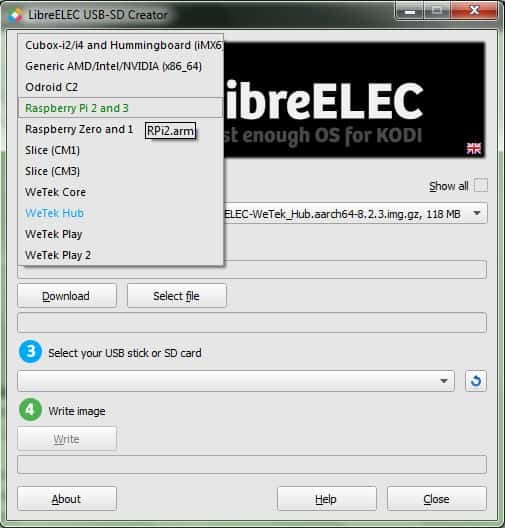 LibreELEC is a very useful operating system for HTPC users. It can allow you to watch TV and movies using Kodi and get great picture and sound without having to spend a fortune. In order to use it, you need a device that can run it, such as Raspberry Pi, Odroid, or WeTek. To install it, follow the instructions in this article to create an SD card that will boot your device into it. If you’ve found this guide to LibreELEC to be helpful, you may want to read some of our other Kodi guides, such as how to watch documentaries on Kodi, how to watch live TV on Kodi, and what to do if Kodi keeps rebooting.